I take this shot several times a year...never really managing to capture the feeling I want. So I was trying to do something with it and this is what I came up with. I must say I like this a bit better than the full-color version. Something about the way the B&W part feels. Just look at the power lines...they seem to go on forever. There is definitely a chill in the air today...not even 45ºF yet...and high is predicted to be 53ºF. It is quite the change from a couple or three months ago. We have had to turn on the heat. In all the years of picking apples, I do not remember it being this cool this early. This type of coolness came at the end of October. Oh, the mornings might have been cool...and I think I remember there being a skim of snow one year for Covered Bridge Festival, but I think that was before I started working at the orchard. Granny Smith apples were the last thing we picked every year....we waited as long as we could....in all the years we worked there, I think we waited too long one time. What is too long you might ask...that is when it comes a hard freeze. Well, one year we did wait...it came a skim of snow...this was around November 2 or 3...well, the boss still wanted them picked. I don't remember why...he couldn't sell them. But maybe it was to use in cider. Not even sure about that. So I picked them...had gloves on...but my hands still froze. Every so often I got down off my picker and went and held my hands in front of the muffler of my picker to get warm! I think that was the one and only time my hands got numb with cold while picking apples. it is still in the high 80's here, we got cooler, it was high 90's until 2 days ago. that is our cold front. but it feels good to wake up to 73 not 85. i do like the edit you did on the photo. 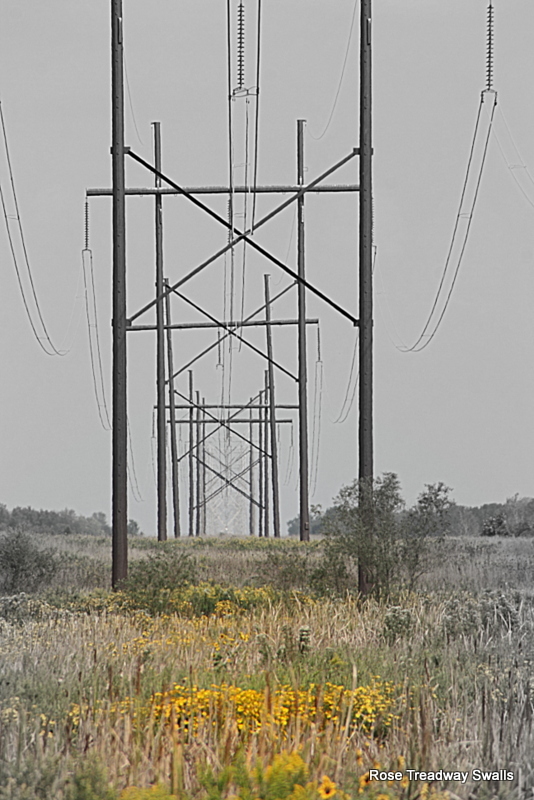 Your power lines remind me of the huge system of power lines around Niagara Falls. got the fire on today here as it's cool. Would have had to turn on the heating but it;s Thanksgiving here in Canada, so have had the oven on all afternoon, so no need for the heat to be turned on. I like the photo. It's getting chilly here too. We had only 19 above a couple mornings ago. Had to scrape frost off the windshield! I like your shot with the innovation of some color in a mostly BW image. Works out very well. That is a very interesting shot. I hate it when my hands get so cold they are numb. Hmmm. I'm glad you had a way to warm your hands every now and then. I love the way the powers lines seem to go on forever. Great shot Rose!